Custom Ice Cream – How 'Cool' is That? 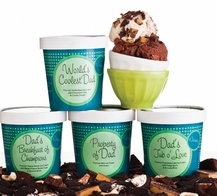 How about this year, we design, personalize, and send Dad his very own ice cream, Sorbetto or Gelato? eCreamery is offering just such an opportunity and with 50 deliciously different flavors and around 40 different mix-ins I think it sounds like a perfect solution to the age old problem of just what to get Dad. No matter what you make, your frozen creation starts from fresh milk, cream and sugar and other fine ingredients. You simply pick your base, select up to 2 flavors and 2 mix-ins and follow the very user friendly web directions in order to pick your packaging and finally name your original gourmet creation. eCreamery lets you create your own sampler packs, give personalized ice cream gifts for birthdays, congrats or even the perfect I’m sorry, So choose ready-made ice cream, make your own custom flavors or go all out with an ice cream of the month club… just make sure your sister gives Dad her stupid tie first, and then you’ll really look like a hero! Custom ice cream starts at around 50 bucks a half gallon, shipped as 4 pint sized containers on dry ice from eCreamery.com. No, its certainly not cheap, but this is dad were talking about….